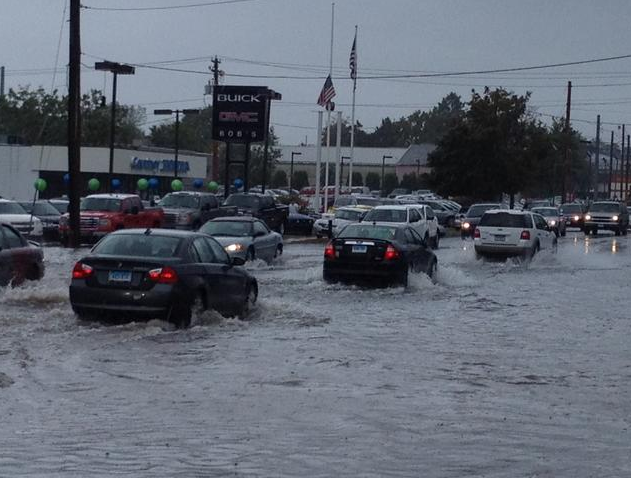 Friday’s flash flooding from Bridgeport to West Haven was impressive. Sikorsky Airport had their 4th wettest calendar day on record with 4.80″ of rain! Here’s what the storm observations looked like at BDR – note the P0185 remark which, in this case, indicates 1.01″ of rain in 18 minutes! The storm knocked the ASOS out of commission for about an hour and a half but the coop observer came to the rescue with the final 4.80″ total edging out the June 1982 storm’s 4.79″ (check this out to see what happened during that flood to the east near Essex). Someone on Twitter asked me “do you know of anyone or any model that called for nearly that much?” The answer is of course “no” but I certainly wasn’t surprised in the least to see so much rain fall. While most of the state saw 1″ or even 2″ of rain predicting small areas of excessive rainfall is very challenging even several hours in advance. Storm scale and mesoscale complexities dictate the evolution of flash flood events and they’re notoriously difficult to pin down. That said there were some signals. Here’s the 12z OKX sounding. Some things say… fill the sandbags on this sounding. Other things say… ehhhhh maybe not. Any time you get a strong low level jet and associated warm advection/QG forcing you’re interested in September. There’s not much CAPE on this sounding, however, and there’s relatively low values of precipitable water. The surface dew points is a pathetic 54ºF but they would rise here on Long Island through the morning as a warm front pushed cross the Island from Queens to the North Fork. By 16z there was a solid surge of high dew point air south of the warm front that has progressed north of Long Island. This is typical. Warm fronts LOVE Long Island Sound. They hate moving inland into Connecticut. While some of the ingredients for every rains were missing (Low PWAT values for September, limited instability) there was a favorable mesoscale regime for convection. For one, convection that initiated in the warm sector over New York City (look at the 69ºF dew point at EWR and 68º at JFK) was able to ride along the convergence associated with the warm front. 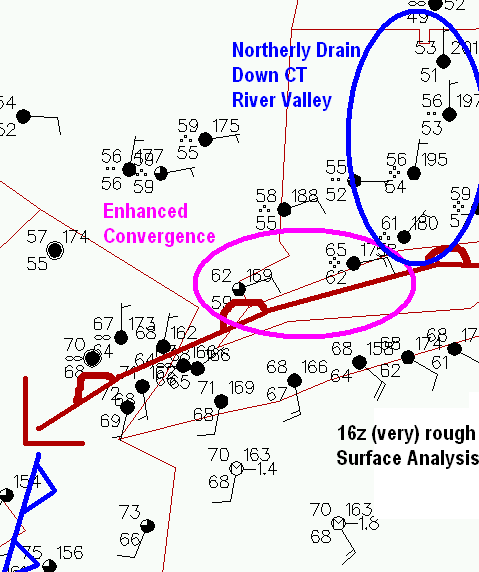 There was also an ehanced area of boundary layer convergence on the Connecticut shoreline, particularly south of New Haven. Note at 16z the wind at Sikorsky was from 80º at 14 knots gusting to 23 knots. At 15z the wind at Sikosky was sustained at 18 knots. Meanwhile at White Plains, a bit inland, winds were generally about 5 knots less than at Bridgeport. A touch of frictional convergence juxtaposed with a larger scale zone of convergence along and north of the warm front in the Sound was a perfect environment for convection to maintain itself and develop. There may have been another issue at work from BDR and points northeast. The geography of central Connecticut allows northerly winds to drain down the Valley from Springfield to New Haven (I know, the Connecticut River takes a left turn at Middletown… but for all intents and purposes the valley continues south to New Haven). Northerly ageostrophic flow loves to channel down the valley when there’s a warm front to the south and this may have enhanced convergence even more across towns like Milford and West Haven. Here’s a radar loop showing the flooding rain across the shoreline. While the general synoptic pattern was marginally favorable for flash flooding the mesoscale setup was quite favorable along the warm front. But in the end it was storm scale processes that made the flooding happen. Given the strength of the low level jet and backed winds along the front there was impressive amount of low level wind shear. That lead to some interesting organization in the convection that formed along the warm front. Here’s how the radar looked around 16:30 UTC when Bridgeport was in the process of getting 1.01″ of rain in 18 minutes. 1630 UTC OKX 0.5º Base Reflectivity and 0.5º Base Velocity. The purple arrows indicate radial wind direction. The radar shows the convection seemed to acquire the characteristics of a tiny line echo wave pattern (LEWP). You can see that on both reflectivity and velocity data. In the METAR obs at the top of this post you can also see the dramatic wind shift at BDR from strong 80º to weak 360º between 1552Z and 1607Z. Isn’t it nice when everything agrees? While the larger scale (synoptic and mesoscale) pattern was favorable for a large area of overrunning and convection with a 40-50 knot low level jet it was actually storm scale development of a small and intense area of convergence that lead to the truly intense rainfall amounts. The already enhanced convergence as discussed above may have promoted the development on convection on the northern flank of the LEWP that was straddling the Connecticut shoreline. 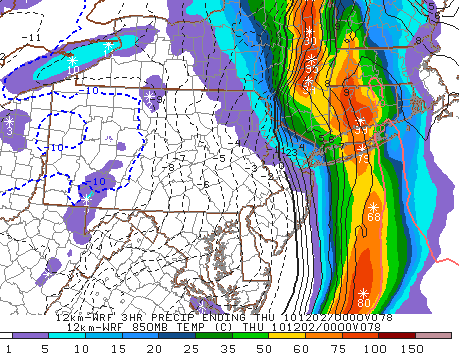 The LEWP eventually went on to develop a bookend vortex/low level mesocyclone (south of the initial weak mesolow near BDR) that tracked south of New Haven Harbor in the Sound toward East Haven and Branford. Pretty neat, eh? This event really displays the complexities in forecasting exactly locations of convection with much lead time. While we can recognize ingredients for flooding and convection well ahead of time forecasting the exact evolution of the details is a challenge. The synoptic ideas are always easy but the mesoscale and especially storm scale details are difficult to resolve much ahead of time.